DIANE KNOX: This is Secret Golf with Elk and Knoxy. Hi, my name is Diane Knox. Welcome to our podcast. I will be doing this in conjunction with the main man, of course, Elk, or Steve Elkington. I don't know why we both have two names. So you can call us either or. Just don't call me Steve. Thank you very much for listening. Hopefully you will tune into our podcast every week now. To get started, what I wanted to do was tell you a little bit about Secret Golf, who we are, and what we do. Now, Secret Golf was founded by Steve Elkington. And Steve just-- you know, after his life and after playing on tour for so long, he wanted to be able to give you an inside look at the lives of some of the best golfers in the world. All of our players are assigned to Secret Golf. Elk handpicked not only for their skills, but for their personalities, as well, and for their ability to be able to explain themselves to you, to us, so we know exactly what they're talking about. The other side of it is Elk would pick a player, and then, for example, Jason Dufner is good friends with Patton Kizzire. So Jason spoke to Patten. And it kind of works like that as well. So you know the players we have, our friends, too. But they have been handpicked for the unique ability that they have to really delve into their game and be able to explain it to you. After playing on tour for years, Elk said the most common question that he always get asked by people who-- you know, amateur golfers who wanted to get better-- was, how did you do that? What were you thinking? How do you get out under pressure? How do you deal with that situation? So that's why he wanted to get secret golf going, to give you those answers. Elk's known for his swing. And he's really good at making players talk about their swings, as well. Every golfer out there wants to know how the pros swing. And Elk gets that all for you from these guys and girls. Now, the great thing is everything is available on our website, SecretGolf.com. You can go to the website and find out more about the players that we have. So Steve Elkington, obviously. But we do have some huge players from the PGA Tour, the LPGA Tour, and the Web.com Tour as well. I was going to say, I can tell you about a few of them. But I'm going to give you the whole list, and then you can take it from there. Because it is an impressive list. Jason Dufner, Pat Perez, Colt Knost, Jason Kokrak, Jason Gore, Bradley Hughes, Ryan Palmer, Brian Harman, Patton Kizzire, who are our two new signings. Great to have them on board. Mr. Jackie Burke, oh, a legend. As always, fantastic to hear from him and what he's got to say about golf in general. For the girls, Brittany Lang, Gerina Piller, Gaby Lopez, and Stacy Lewis. And then from the Web.com Tour, we have Ethan Tracy and Martin Piller. Now, the thing is, Elk has a personal relationship with all of these players. They're all people that he talks to on a regular basis. They maybe see him as a mentor, as a friend, and as a little bit of a coach. I guess his relationship with each of them varies, but he's in regular contact with all of these players. And the way that he has his relationship with them means that he finds out stuff about their lives that you wouldn't really get anywhere else. You wouldn't get through any other golf channel. So that's what we want to give to you, an insight into these players' lives. Now, if you go to SecretGolf.com, we have three sections on our website. The first one is called Get Better. Now, maybe you are on the driving range every single week. Maybe you're out playing with your friends, whatever. And there's aspects of your game that you really want to work on. It could be the grip. It could be your backswing, your downswing. What you can do is go on our web site and click on an individual section. And then you'll hear from our professionals about every little bit about their games. So they can give you some pointers on your downswing if that's what you're looking for. And you have it all in that one area. So it really does help you get better and improve your game in the elements that you maybe struggle with a little bit more than others. The second section is our Tour Players. So that's when you can go on, and you could click on Steve Elkington's face, for example. Or you can click on Ryan Palmer or Gerina Piller. And they go through every single bit of their game. So you'll hear them talk in-depth about how they play, how they get better, how they think about it, how they approach a shot, how they approach a tournament. And again, it's all about their putting, their bunker play, their setup. Every little bit you will hear straight from the horse's mouth. And as I said before, it's access to these players that you don't really get anywhere else. It's very, very specific and very special to Secret Golf. The third section we have is called The Big Show. Now, we filmed three seasons of award-winning Secret Golf, the show, where we would travel around the US visiting the top public courses, and meet people who are really passionate about golf. That's what Secret Golf is. It's about passion. And we want to give you a passionate view, an insight, that you're not going to get anywhere else. Now, through this podcast what we're going to do is give you access to these players. We are going to be talking about the lives of the players, what they've been up to, what's going on in their lives. Also, you know, news from the golfing world and looking at all the events that are taking place at that time, as well. For example, this week is the WGC-Bridgestone in Akron, Ohio. And next week the PGA Championship. Now, we have a lot to do around the PGA Championship, because Elk won it, of course, in 1995. This week on the podcast, we're actually going to be talking to Jason Dufner. So you'll hear that in just a few minutes. Jason Dufner, another past winner of the PGA Championship in 2013. And also he is playing in the WGC-Bridgestone right now, this week. Jason Dufner is actually one of Elk's best friends. That's what I talked about earlier, as well, that Elk really does have a friendship with all these players. And the good thing about that is, is that they will open up to him. And they'll tell him things that they probably wouldn't tell someone else that's interviewing them, maybe before a round or after a round. So you really do get their true personalities. And they're very, very honest with Elk. I don't think they really have a choice in that matter. I guess there's a respect level there, because Elk played on tour for such a long time and achieved so many great things. Winning the PGA, winning the Players twice, to name but a few. But they know that Elk understands their life. It's a strange life. They're-- they are the elite golfers. They are the best of the best. And Elk understands exactly what they're going through. Likewise, he knows what they're going through. So they really do open up. And you see a side to them that you probably wouldn't see. One of the best things about Elk himself is he is such a good storyteller. So the things that he will talk about are just-- again, it's a perspective that you don't usually get to see. And Elk's anecdotes, his funny little, quirky Elkisms, shall we call them that-- you're going to get to hear those firsthand, too. PGA Championship next week. And obviously we're going to be talking more about that over the coming podcasts. Because Elk has some fantastic tales from '95 when he won. But first of all, to get started, I promised you Jason Dufner. Elk caught up with Jason Dufner this week before the WGC at Bridgestone started. It's at Firestone Country Club in Akron, Ohio. Now, Jason Dufner it was born in Cleveland, Ohio, so great for him to be back. He has set up his home in Auburn, after going to college there, playing golf, and building his house there. So that would be his home. But he is an Ohio boy through and through. And Elk got him on the phone before he teed off in the tournament this week. STEVE ELKINGTON: I am with my great friend, Jason Dufner, who is, this week, currently playing in Akron, where he is a resident. Or was born in A-- were you born in A-- were you born in Cleveland? JASON DUFNER: Cleveland. I was born in Cleveland. So this is a semi home event for me. STEVE ELKINGTON: Um, what do you recall of your childhood? Particularly the winters I'm interested in. You played ice-- ice hockey? JASON DUFNER: I'd come down in August from Cleveland and-- and watch these tour players play. I'm sure I saw you play a couple times. And, uh, I remember, uh, following Fred Couples and [INAUDIBLE] one day, and Nick Faldo and John Daly another day, and watching all the greats of the game. Play-- I remember one year, they played the golf course across the street, Um. STEVE ELKINGTON: I play-- I played that year, because I played across there one year. So maybe early '90s? JASON DUFNER: Yeah, I think I remember watching Ernie Els play with-- I don't know who he was playing with. But, um, so this place has-- has got a little part of my heart. I've played the American Junior Golf Association event. Uh, we've played the golf course across the street over there. So I'm familiar with, uh, the lay of the land this week a little bit. And had some good results here. I usually either finish in the top 10, uh, or the bottom 10. One or-- one or the other. So hopefully we'll have some good stuff. JASON DUFNER: You need a straight ball. Straight ball works here. Um, and I would venture to say the weeks that I have those top down, I'm probably playing from the fairways. In the weeks I'm not in the top 10 here, in that bottom 10, I'm playing from the rough or the bunkers. Um, but yeah. There are a lot of straight holes. There's a lot of blind tee shots. Um, so that can be a little bit tough. You don't see no landing areas on, um, I'd say seven or eight of the par fours. STEVE ELKINGTON: So you're saying if the ball lands out of sight, right, you don't see it land. JASON DUFNER: It's a golf course. You got to play some to know where you want to go. STEVE ELKINGTON: Yeah. Let me ask you a question for people that are listening about playing a straight hole. So Jimmy Demaret said before, uh-- you know, if you're playing a straight hole like a bowling alley-- you know, Jimmy Demaret said that if you aimed right down the middle, and you push it or pull it, you're only playing to half the fairway. So he said on those straight holes, he would aim down the left. And he would fade it into fairway. I don't-- you know, I did hit a lot of fade shots. But that doesn't always sort of register. How do-- I mean, is there a way to play these straight holes? Like the first tee shot, for example, at Akron-- well, Firestone-- is the most straightest par four. It's probably a three wood shot for you or something like that. But it's a very straight hole, right? JASON DUFNER: --and hit it straight. JASON DUFNER: It's tougher, um, trying to hit a straight ball. It's not something you do a lot. Um, I think-- you know, like we said, you've got to be in the fairways to play here. The greens-- a lot of the greens are elevated. So if you're not coming from the fairway, it makes it really, really tough to hold the greens. Um, they have a lot of movement in them, too. So if you're missing greens, it's not the easiest place to chip and pitch. Um, usually there's some rough. So it's a good test. Um, a lot of straight holes. Um, but if you're in the fairway, it seems like you've got a lot of scoring clubs. You know, eight irons and down. DIANE KNOX: Steve Elkington talking to Jason Dufner there. I don't know if I'm allowed to say that Jason Dufner is one of my favorite players that we have signed up for secret golf. But he really is. I love the way he talks about golf. Ohio boy, great to be back playing in Akron this week. And I do love the fact that he said that he either plays really well, or really badly here. Either top 10 or bottom 10, and there's not much in between. So good luck to Jason Dufner this week in the WGC-Bridgestone, and we hope he does great. Always supporting him. Now, next week is the final major of the year, the PGA Championship at Quail Hollow in Charlotte, North Carolina. A lot of talk around this one, what with it being the final one of the year before the FedEx Cup playoffs. And also a lot of talk regarding Jordan Spieth. Now, Jordan won the open just a few weeks ago in spectacular fashion. And if he can win the PGA Championship, he will complete the grand slam at the age of 24. I guess we will just have to wait and see. Now, two people who know exactly what it feels like to win the PGA Championship are our very own Steve Elkington, who won in 1995, and Jason Dufner, who won at Oak Hill in Rochester in 2013. Now, Steve has been chatting to Jason Dufner for this podcast and really wanted to relive the memories of 2013. And of course, look forward to next week. STEVE ELKINGTON: Before I want to talk about Quail Hollow next week, I want to go back a little bit, uh, and talk to you about your win. I had a great conversation with Jackie Burke, who's a good friend of yours who won in '56. And we talked a little bit about-- what comes to mind to you, right out of the gate on your win in '13? JASON DUFNER: Um, I think just how well the golf course set up for me and, um, what I do well. Um, you know, I-- I'm really good on golf courses where everybody has to play with the same position, more or less, after their tee ball. Um, we get a handful of those a year. No advantage gained for a long hitter. Um, maybe a hole or two. But, uh, Oak Hill has a lot of fairways that end at maybe 300 yards. Or they start bending in one direction or another. Um, you know, the first hole has got just enough dogleg to the left that, um, we all have to pretty much play from the same position. Um, same with the second hole. Um, you know the ninth hole bends just enough. It's the seventh hole, the fairway kind of stops. Um, the par five 13, I think-- or 14, 14, the par five-- no, 13 the par five, there's a ditch at 300. So with that, I felt like I had a good advantage. Because now we're all playing from the same position, having the same numbers, roughly, into holes. And I felt like that was a good advantage for me. And it helps to be playing well. I finished, I think, fourth or fifth the week before here at Firestone. So I had some confidence rolling into that week. Uh, Oak Hill was a tournament-- or a venue that I had played before with the US Amateur. Um, I shot, I think, the second lowest score in the US Amateur when we did the stroke play, um, that week. I won a couple matches during the US Amateur. So I had some familiarity with the golf course. Um, but it's set up good for me. And I felt very comfortable, um, going to that golf course. JASON DUFNER: Mm-hmm. It was one of those days for me. And-- and like I said, sometimes it's a Thursday at the Honda classic. And some days it's a casual around at home with your friends. Um. JASON DUFNER: That day just happened to be the second round of the PGA Championship at Oak Hill. That gave me a huge advantage against the field, to shoot, you know, seven under. STEVE ELKINGTON: Is that-- was that going on for you? STEVE ELKINGTON: Is that something-- I mean, can you-- can you tell me about that? Uh, a lot of pe-- a lot of people say that. They don't really know what that means. But why don't you give me your description of-- or your explanation why you think it's important, even though it's more pressure, or whatever. Give me your, uh, idea about, you know-- getting in that final group is better than not, right? STEVE ELKINGTON: You're the last man to look at it, right? You're the last guy to look at it. JASON DUFNER: --like you talked about earlier, my putting wasn't quite as good. I'm missed-- um, the front nine was pretty clean. And then I missed, uh, I think four putts in a row inside of eight feet on the first four holes on the back nine. I literally-- I think I turned at three under. And I could-- literally could have been seven under through 13 holes pretty easily. The ball striking propelled me that week. My putting Was good enough. Um, but in major championships, ball striking usually trumps, um, pitching, chipping, and putting. Although we didn't see that a couple weeks ago. STEVE ELKINGTON: Yeah, exactly. Um, do you think that it helps you to not win two years prior at Atlantic Club when, uh, you sort of stumbled at the end? Do you think that-- mentally, did that-- did that help you? It had to have helped you out at Oak Hill, I'm sure. JASON DUFNER: Definitely. It-- it-- it, um-- you know, what happened in Atlanta a couple years ago helped me a lot with my career. It gave me the confidence that I could get in that situation. Maybe I didn't quite handle it as well as I would have liked or finished where I would have liked. But, um, that was the first time for me to have a chance to win major championship. So what it proves to me is, physically, I could do it. Mentally, there are some things I need to get better with, confidence-wise, belief. Um, that's the tough thing about golf. It's you. You're the one that's doing everything. There's no teammates to lean on. Nobody's hitting shots for you. Nobody's giving you assists. Nobody's, uh, getting offensive rebounds, like in basketball when you miss your shot. Um, it's all on you. So that's a lot to handle. Um, it's a lot to kind of manage during 18 holes. And-- and I think I was better off for it. It made me a little bit hungrier, probably. Uh, it made me work a bit more. And, um-- but the biggest thing is-- you know, it gave me a lot of confidence. JASON DUFNER: --achieve that more than, maybe, in Atlanta. STEVE ELKINGTON: We also know that there is-- the air is different to breathe in the, uh, last round of a major, when you're near the lead. And, you know, I think, once you felt that in Atlanta, it's almost like you, uh, crave that feeling again, even though it's a lot of pressure. You crave that, because you-- you actually have an advantage, because you felt it before, right? To a person that's never felt it, uh-- for people that don't understand that there is a different-- it's-- there's a-- there's some different H20 floating around the golf course when you play in a major. Is that true? JASON DUFNER: --and through the hype of the majors, and how-- how the individual perceives them. But, um, you know, I always use that phrase. You know, sometimes if you're going to ride the bull, you're going to get thrown off of it. And that's OK, too. It's not necessarily always a bad thing. STEVE ELKINGTON: You're still grinding when you go to the next week-- next week at Quail. STEVE ELKINGTON: It's certainly nice to know the have-- you have one, right? JASON DUFNER: Yeah, it's definitely nice to have your name on that trophy and be linked, um, with all the great names. I can't really think of many of the greats that aren't on that trophy. Um, I know Tom Watson hasn't won one. And he's about the only one that I can think of that isn't part of the history of that championship. JASON DUFNER: And that's about it. STEVE ELKINGTON: --we would have to have had at US-- US Open, you know. STEVE ELKINGTON: Um, so what are you-- what are your goals, whether they're physical, mental, or equipment, or whatever it is. What are the goals for you next week going down there? Is there something you're going to try to get accomplished before the-- before the bell rings down there? JASON DUFNER: I think just being-- the-- the two big things for me, um, this time of year-- physically, I should be ready to go. I shouldn't have many question marks. Obviously, um, that changes day to day and week to week a little bit. But I should have a good grasp of what I'm doing well, what I'm capable of doing, and sticking to those, um, things physically. You know, I should know where my ball striking is. I should know, well, what shots I can hit, what I can't, at this point, here. Um, I think the two biggest things-- mentally, just kind of trying to dumb down the major week, so to speak, quotation marks. STEVE ELKINGTON: Take a little pressure off? JASON DUFNER: Just-- just making it-- yeah, it's a big event. All the best in the world are here. We're playing a great venue. But not putting so much stock into it that it's the final major, and I feel the pressure of having to perform well. And then also, for me, it's going to be a preparation. Getting on the golf course, seeing the golf course, seeing how holes play, uh, strategy-wise, what's going to be best for me. Um, you know, what's best for me might not be best for another player. Um, not everybody's going to play the golf course the same way. Um, so figuring out what's going to be best for me. What can I do that bring my strengths of the week, uh, in that golf course to the forefront, so that I can have the best week that I possibly can. JASON DUFNER: --the biggest challenges for me. STEVE ELKINGTON: Got to-- got to get low again. JASON DUFNER: --a lot of credit of how well some guys can do that, week in, and week out. Because that's one of the most challenging things that nobody really talks about, is how well people can adjust, you know. STEVE ELKINGTON: I-- I think you're right. I think you and I were texting when you made the cut. You had a good finish on Friday. And you and I were texting. And what were you, at plus three? Plus four, plus three? JASON DUFNER: Plus four. Yeah. Six over through 32 holes. STEVE ELKINGTON: And-- and-- and I-- you and I were texting and-- and I said, hey, you know-- I think I said something like, let's get back to even for the tournament, right? STEVE ELKINGTON: I said that's going to-- I think I-- I said I-- I text you, and I put in quotation, money-- money sign. And I think-- what did you finish, two under? JASON DUFNER: --40 holes or so, uh, eight under. So pretty good. JASON DUFNER: You know, that was pretty close. JASON DUFNER: Yeah, that's my highest finish. JASON DUFNER: I think it's just a mixed bag of it. I think-- you know, I kept telling people at Memorial that week, it's a 72-hole golf tournament. Yes, I'm frustrated, disappointed with what I did in the third round. But I still have a chance to win. So, um, we play 72 holes for a reason. You'd love to shoot five under on your first nine holes. But if you don't, it's not the end of the tournament. Um, and I think that just comes with maturity, and playing a long time, and-- you know how it is. It's the law of averages out here, to be honest with you. STEVE ELKINGTON: Oh, yeah. Oh, yeah. You're right. JASON DUFNER: Just when you think it whupped is when you start shooting 40s on nine holes. Um, it's going to catch up. JASON DUFNER: --for a long time. Um, and people kind of looked at that as to what is normal. But that was extremely abnormal in what we do, uh, out there on the golf course. So, um, you know-- back to your question. It'd be nice to get off to a hot start. But if I don't, it's not straight panic button. STEVE ELKINGTON: Yeah. I think-- someone asked me that question before. And I-- I said, you know, I really enjoyed being one under or something in the first round. And I felt like sometimes if I could get a little better as tournament went along, uh, it seemed like that was-- that was something that, uh, worked well for me. But I'm with you. Uh, I've had tournaments I've done the opposite. Um, it sounds like you're a pretty busy guy when you get to a tournament. I mean, not-- everybody's different. Um, all-- caddy need to do anything? Is there any other insight that-- will you be leaning on him to do anything to get ready for the tournament other than keep the bag right? Will there be an extra club that you'll be looking at next week at, uh, PGA? Or you'll make that decision when you get there? JASON DUFNER: Yeah, I'll make that decision when I get there. I don't change clubs very often to fit golf courses. STEVE ELKINGTON: --since [INAUDIBLE] the course, it's going to be very firm on the green. So you're a big spinner of the ball. So that's helpful right out of the gate. 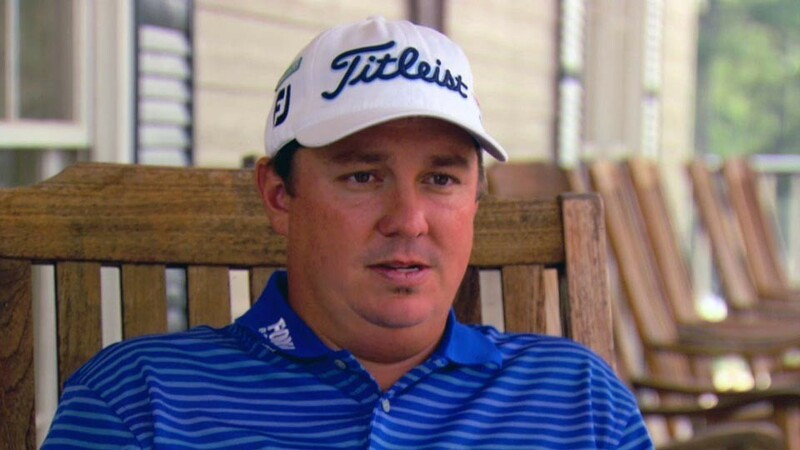 JASON DUFNER: I'm a big information guy. STEVE ELKINGTON: You're an information-- you're an information guy, yes. But you're also a little bit of an old guy-- old school guy. You're not looking for him to pat you on the head in the middle of the round and tell you to hit a nice shot. I mean, you-- you've got all that under control, right? You don't-- you don't need a lot of-- you just need information, right? STEVE ELKINGTON: Is that true? JASON DUFNER: --when the wind's out of the Northwest, we know where that wind is coming on every part of the golf course. Uh, people don't realize that we play holes that change direction 15, 20 degrees. Um, and it looks like it's a straight hole, but it moved 15 degrees. And that's a big difference in wind direction. So knowing all those little nuances. Knowing which way holes run, knowing which way the prevailing wind comes from, um, knowing when shots play uphill or downhill. Even if it's five yards that can be a huge difference, right? STEVE ELKINGTON: Yeah, we're looking at-- you know, a shot per day for us, right, over four shots of a week, you just-- just add up the money that that takes every week, right? STEVE ELKINGTON: One per nine, right? STEVE ELKINGTON: Won the tournament. JASON DUFNER: Won the tournament. For sure. STEVE ELKINGTON: Yes. Yes. OK, Jason. Well, listen, um, I think it'll be great for people to hear the insights of, uh, your game. Because you look pretty relaxed when you're out there. And we know, personally between you and I as friends, you-- as good of friends as you and I are, we know that you're nothing but relaxed when it comes to being prepared for the tournament and preparing your golf game. So good luck this week down there in Akron at your home state. And we'll see you at the PGA next week. JASON DUFNER: Yeah, I'm looking forward to being in the South and, uh, hopefully winning another PGA Championship in Charlotte. It should be a great week. Um, I know they've changed the golf course a good bit. But I know the guys are really excited to be in Charlotte, um, for a major championship and-- and-- and competing next week. So I'm looking forward to it. DIANE KNOX: That was just a brilliant, brilliant chat between two guys who are, you know, both very, very well-respected in the world of golf, but also who are great friends. And you really can tell. I think Steve brings out a side of Jason that we don't usually get to see. He comes across as being very relaxed, and chilled, and a little bit emotionless when it comes to-- to playing golf and maybe interviews pre-round and post-round. But, you know, he's such a methodical player, and so old-school as well. And I think he has a great philosophy when it comes to golf. And it was really good to hear his perspective on the upcoming PGA Championship and, of course, 2013, when he won, as well. I was actually at the Open at Royal Birkdale a few weeks ago, doing some work for the BBC. And I was actually following Jason Dufner's group on the Saturday. He was playing with Branden Grace. Now, I'm sure you know by now, but Brande Grace went on to shoot the lowest score, ever, in a major. So I was actually told, go out and join them on the 15th, and follow them in, and see what happens. See if Branden Grace can shoot this score, of course, to make it into the record books. The thing was, Jason Dufner played incredible. And he shot a 66 on the Saturday. But you know, his fantastic round was completely overshadowed by Grace's performance. Of course, I was there supporting Jason Dufner. But, um, he had a great finish at the Open. Tied 14th. And with his win at Memorial earlier this year, as well, Jason is on fine form. A lot of confidence around his game right now. He's got to be feeling really good about it. And I'm sure he would love to win the PGA Championship, lift the Wanamaker Trophy for a second time next week at Quail Hollow. Well, we wish him all the best. So thank you so much for listening to Secret Golf with Elk and Knoxy. Really good to have Jason Dufner on this podcast. And next time we are going to be chatting to Brian Harman. Brian Harman, another one who's just playing incredible golf right now. In the US Open not long ago, he-- just, what a performance he put in. He was unfortunate on the final day, I guess. But we'll be joined by Brian Harman. Elk will be talking to him to really delve into his game. Brian's one of these guys that-- he's so passionate when he talks about golf, and a bit of a character, too. So that to look forward to. And of course, before the PGA Championship we are going to be joined by Steve Elkington. Of course, we have to talk to the main man about his win in 1995. Steve actually has some fantastic stories surrounding that win, especially one involving Ernie Els's team ordering champagne before the final round got underway. Yeah, that's one of my favorite stories that he tells. So yes, we will catch up with him before the PGA Championship gets underway. And we will hear the story from the man himself. Thank you so much for listening to our podcast at Secret Golf with Elk and Knoxy. Hopefully you'll be back for the next one.